Full Service hair salon that was started by Kelly Palumbo (Deardorff) 10 years ago and located in Shiremanstown, PA. Kelly has been in the business for 23 years, so the experience & knowledge to know the cutting edge styles to stay up on the latest trends and fashions constantly advances the team. Halo is an eco friendly & environmentally conscience salon, that thrive on creating a relaxing, pampering, comfortable experience. 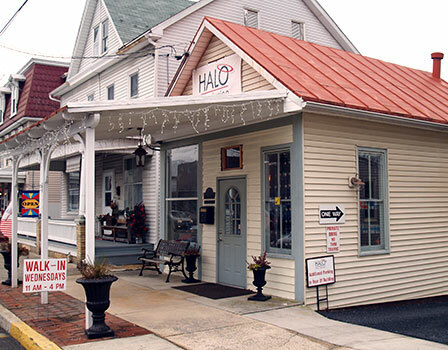 Halo creates an environment where each client & staff is treated as one of the family in a warm atmosphere. Day after day Halo explores what new ways to advance the team with the latest and up to date products. With so many products in the industry filled with many harmful chemicals that have been proven to be unhealthy for our skin & hair. Halo researches ways to protect not only the clientele but it’s staff. Halo’s motivation to keep up with these trends in the product industry is to not only to find what’s new and more health conscious products, but helps provide exceptional customer service experience & happy healthy educated clients. Please feel free to search our site, meet our team and view or join our social media sites to see what we are up to next! Joseph G. Ligget used this building at 17 East Main Street as his blacksmith shop in 1880. 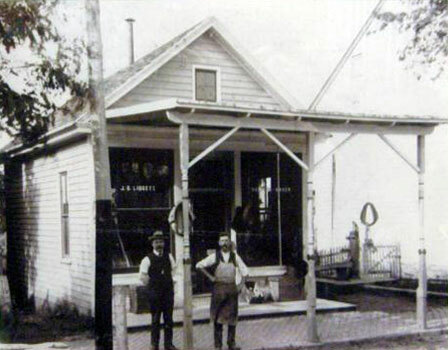 Soon after 1908, it became the first home of the Shiremanstown Fire Department until Howard Beamer moved his barber shop here in 1921. Mr. Beamer’s business continued here until 1953 despite damage from a severe fire which originated in the back room where Mr. Beamer stored old papers and hair clippings. Continuing the barber shop tradition, ownership transferred to Merle Ryder when he purchased the building in 1953. The Maganellis operated The Pump House, a small restaurant, from 1998 until approximately 2003 when it was purchased and used as a private catering business. Kelly and Anthony Palumbo purchased the building in 2009, fulfilling Kelly’s dream of operating her hair designing business in her hometown. She and Anthony have remodeled most of the interior using bamboo flooring and glass tiles. The front section is used as a waiting area and boutique. Many enjoy the seasonal changes in their two front windows.